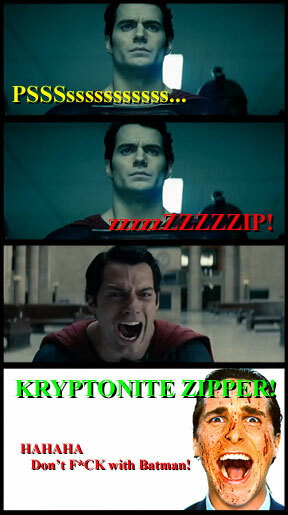 After watching the newest Superman Man of Steel trailers and clips, I had a wonderful idea. Ok, just a stupid idea, about Superman getting caught in his zipper, which was replaced by Bruce Wayne (Batman) in a low brow mode of dark humor. Well, I let it sit, and decided to make this small meme about Superman and Batman having a small rivalry. It may become a small series of panel comics, because I've got like a hundred other ideas from the last decade about this. I call it "Ziptonite." Guess where all that blood came from? In my opinion, Batman will always be the better character overall for a variety of reasons, but I do enjoy them both and hope the upcoming film is good.